2012 flew by sooo fast, it wasn't a very good year for me financially and job wise, but I had my health, my family, friends and my boyfriend to be thankful for. New Years Eve, my boyfriend and I went out and had dinner at my uncle's house, but by 10 pm I was itching to get back home- to My fur babies (!) Cinnamon and Zoey! We had a quiet night in and had the girls huddled around us while we watched the countdown. I remember telling cinnamon to scoot over;) she cheekily kept sitting between my bf's and my lap- she was breathing hard but her tail was still wagging back and forth- she was happy. She kept us awake most of the night- she was restless, breathing hard and it was hard for her to be comfortable in one place. 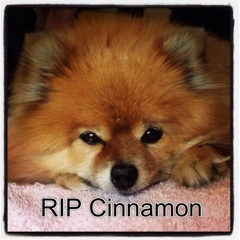 I won't go into every detail because honestly I don't feel like reliving it:( Cinnamon's little heart finally gave out and she died at 12 noon, Tuesday January 1st, 2013. 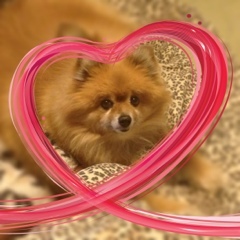 My little girl is gone. I don't have any children- she and Zoey are my kids. My heart is broken and I'm not dealing with it very well. I want to keep blogging and talking makeup- and I will soon. But right now all my thoughts and concerns are taken up by the fact that I won't ever see her beautiful eyes, or her wagging tail as I come through the door. When I was looking for a name for my blog- I chose to include their names because my love for them was always on my mind. The blog will live on for my little Cinni. So again I leave you with some pictures of her that I loved and hope that everyone had/has a safe New Year with many blessing. It's been an amazing blogging experience for me-meeting new friends, participating in my first international swap, here's hoping 2013 will be just as amazing.